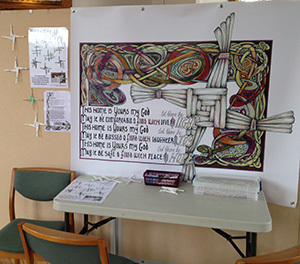 This piece is 'Home Blessing', visitors were invited to follow the instructions and make their own Brigid Cross to take home. This item is 150CM X 125CM (1.5 X 1.25 meter) and is printed on 550gsm PVC. It can be supplied flat with no finishing, with eyelets at the corner, with pole loops top/bottom and hemmed if required.